Oh, wow! For last week I was working on my Blood Angels Terminator Squad. This week seemed like eternity, and there’s lots of red, you know:) There was no other option than a break and paint something quite different. Quick glance at my desk – Skaven’s Screaming Bell, Warpfire Fire Thrower, Jezzails, Malifaux’s Lilith with her crew, and one lonely model from Infinity – Reverend Custodier from Nomads, Bakunin. And the last model was my choice. I thought it will take me around 3-4 hours to complete the model, just like I wrote, quick break from Blood angels. And, of course, there was no surprise, to complete this model I needed much more. Total time of painting: 6 hours (but to be honest I was not sit on it entire time…) . I always tend to underestimate the time for finishing my painting job. Infinity is new thing for me. I was thinking about enter to this game for some time now, but there was always something on my way – like for example, more Skaven needed to be painted, and as probably you aware demand fort Skaven in any vermin horde is too big. There are always more models to be painted. The other thing is, I Am, I was, and I always will be Warhammer guy – I was starting both from WHFB and WH40k in 1990s and they were my very first miniature games. And I always will stick to them no matter what. So when I look at my minis collection and I’m thinking my next model to be painted, I subconsciously choose Warhammer model as my first choice. I just can’t help it. …but there are so many models other than Warhammer hidden in my “Unpainted’ boxes and I need to finally push some other projects forward. I have Wolsung (already some models ready for game), Malifaux ( amazing minis) and Infinity (also super cool !). 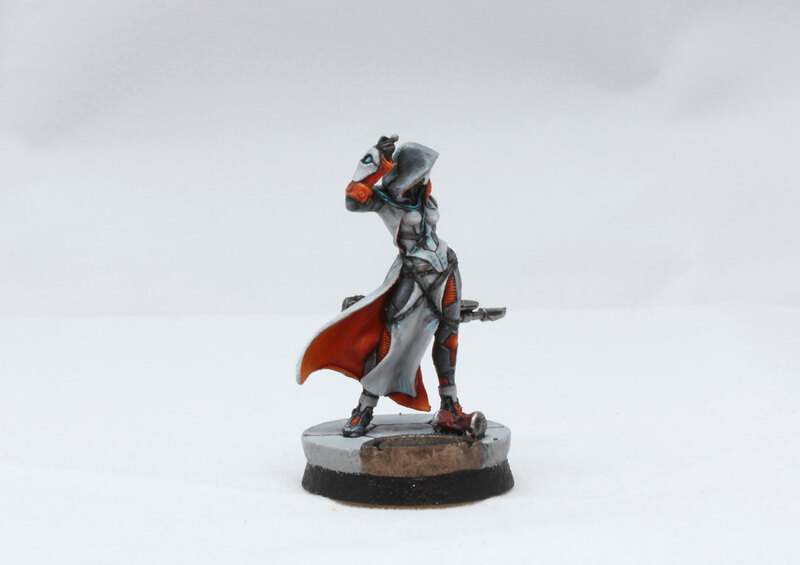 So0, sorry Warhammer…I’ll be making more breaks like this – painting this Infinity mini was hard, time consuming, but amazingly pleasure experience. And I want more! When I decide to buy some cool miniatures from game that is completely new for me, I always follow the pattern. The most important issue I look at is which side/faction/army has the models, that are appealing to my sense of aesthetics. I don’t care about rules. Sometimes I don’t know even any fluff, but sculpts are the most important. Of course, I know, it’s impossible that I’ll like all the models from the faction I chose, but it’s necessary that there are at least few to choose from, and have a good fun while painting them. I’ve bought this miniature in May 2015, and from that day I extend my Infinity collection to around 15 models (still waited to be painted) all from Bakunin. I’ll do it some day and slowly, step by step, I’ll have enough models to play Infinity. 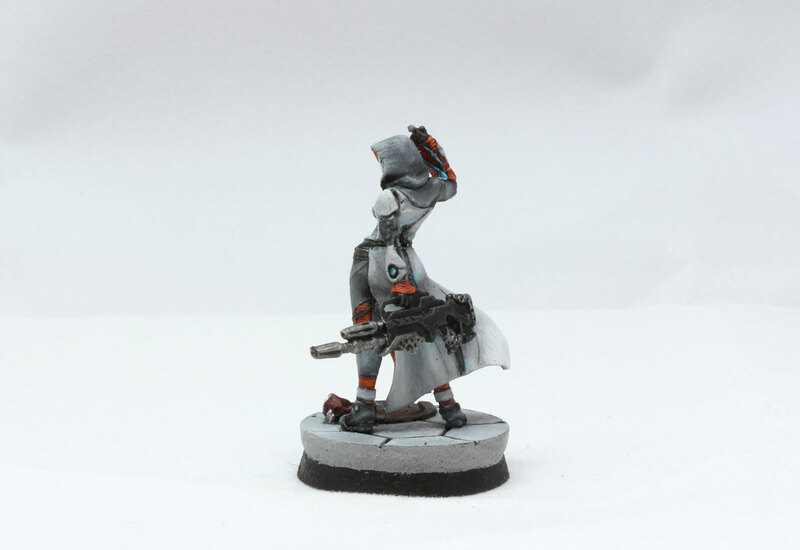 Paints used: hood and coat – Mechanicus Standard Grey (mixed with White Scar or Administratum Grey in lighter areas) and Administratum Grey (lighten with grey/white mixture). Undercoat area: base – Wild Rider Red, and lighter area starting with Troll Slayer Orange, and all lighten with mix of Orange and Yriel Yellow. To paint suit I used similar paints: Mechanicus Standard Grey and mix of red/orange/yellow. The base is resin Urban base from Micro Art Studio designed for Infinity. I’m quite satisfied with the painting job. Of course, I could have painted it better. It ALWAYS could be better. I could have painted it for 6 more hours, and get better effects, but it’s not the point. There are far too many minis to be painted, and so little time:). But as for the very first Infinity model – I say – looks good. Now, maybe 10 more and I can finally play the game:). As for other plans – there is high probability I will play my first Age of Sigmar game next weekend. I promise I’ll write my impressions here. Fingers crossed I’ll have so much fun as they promised me in any GW store;). Next PostStarting my next project: Neverborn – Lilith Mother of Monsters.